Anyone who has little kids knows who these guys are. They are regulars on the Elmo's World show and The Phi LOVES them. It is the only thing on TV that makes her crack up laughing everytime they come on. The first time she started laughing I thought it was a fluke and she was just being silly. But she totally LOL's everytime one of these guys comes on. They are 2 old dudes who are brothers. And Elmo always asks them a question about the topic of the day. Today's episode was about dancing fast. 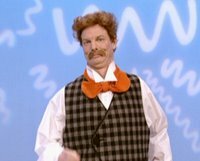 One time he showed Elmo how he washes his hands, and the Noodle Family dance which was a rare episode with the 2 brothers together. The kind of freak me out and are like two old creepy dudes. Plus to make it creepier they don't talk. So they are like badly dressed mimes. My baby has a strange sense of humor. OMG~Elias LOVES Mr. Noodle too. (He calls him/them "Mr. NooNoo") In fact, he was talking about Mr. NooNoo this morning when I was trying to kiss him good-bye. 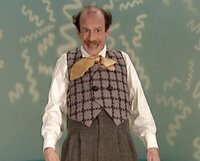 i always thought mr noodle and his bro were the same guy! I remember them too! The guy on the right is Michael Jeter (he was on that t.v. show Evening Shade) a homosexual actor that died in 2003.